Chocolate Cake Banana Splits. Vegan, Oil- & Gluten-free. Chocolate Cake Banana Splits. Vegan, Oil- & Gluten-free. So how does it bake and taste? I am very impressed with Xyla. The look and feel is spot-on to refined sugar and I discerned absolutely NO difference in taste – even when simply stirred into tea. The nice thing is that there is no adjustment needed in ingredients – as one must do when using stevia – Xyla is a 1:1 replacement for refined sugar. Along with the bag of the crystals, Xylitol included several different kinds of candies. Since I don’t eat candy any more, I can’t tell you how these taste. Instead, I’m giving away three cute tins of Xyla candies (cherry, watermelon, and cocoa-mint) along with a pack of their spearmint gum. Enter the giveaway at the very bottom of this post. It’s open until August 13 and everyone from around the globe is welcome to enter. Now – for the cake. I have this nifty little New England hot dog bun pan that I got from King Arthur Flour (their catalog is a drug I can’t kick…) and sure, I’ve made hot dog buns with it, but I also discovered while looking through KAF’s blog a recipe for chocolate cake buns. Stuffed with bananas, cherries and whipped cream, this was an idea I could not resist. 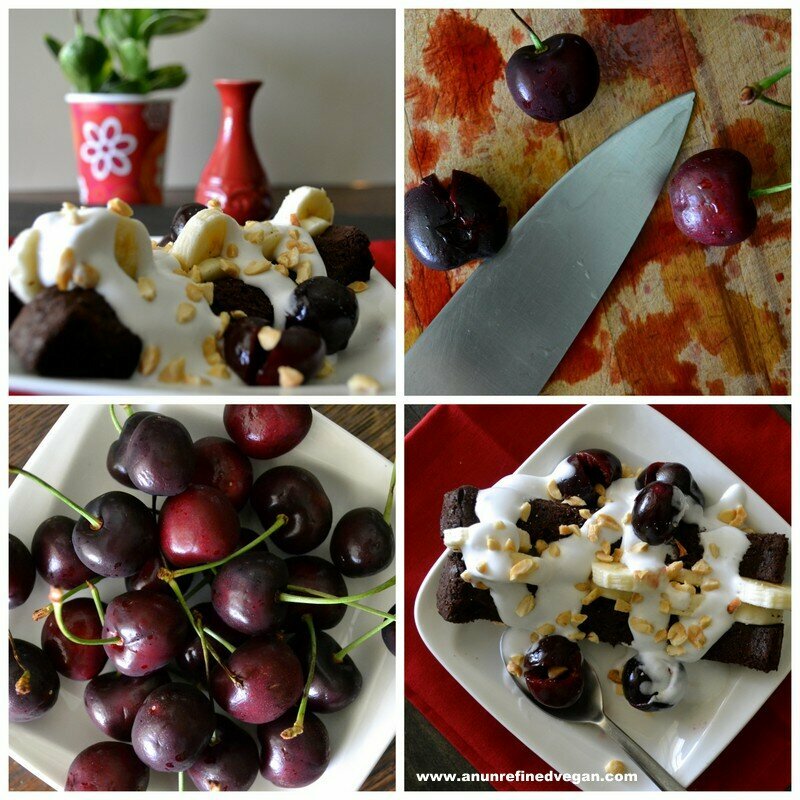 I went with a gluten- and oil-free version and used fresh cherries instead of those scary nuclear red ones that come in a jar – and I topped my splits with coconut cream and chopped peanuts. These would make a fantastic treat for a child’s birthday, but since I haven’t really grown up, they’re also fantastic for “young” adults like me. If you don’t have a hot dog bun pan, use a 9″ x 9″ pan, cut cake into pieces and top with the fixings. Rich chocolate cake stuffed with bananas + smothered in fresh cherries and coconut whipped cream = Chocolate Cake Banana Splits! Vegan, oil-free, sugar-free. Preheat the oven to 350-degrees F and lightly spray pan with oil. Set aside. In a medium-sized bowl, whisk together the flour, stevia, Xyla, Dandy Blend (if using), cocoa powder, baking powder, salt, and xanthan gum. In a large bowl, combine the flaxseed meal mixture, nut milk, yogurt, and vanilla extract. Add the dry ingredients to the wet and mix thoroughly. Pour the batter into the prepared pan. Bake for 40-45 minutes, testing the center with a toothpick to make sure cake is baked all the way through. Let cool in the pan for a few minutes, then remove and cool completely on a wire rack. To serve, cut about 3/4 of the way through the domed part of each of the 10 “pieces” (creating a place to put the banana) – then separate them into individual buns (cut down through the deep crevice part of the cake). Divide banana slices among buns, drizzle with coconut cream and top with cherries and peanuts. Pumpkin & Maple Spice Quickbread. Click photo for recipe. How cute is that hot dog pan, what a great idea to bake the cakes in it! Hehe! I guess I didn’t eat enough to experience that, er, side effect. Or maybe I’m just “windy” anyway ;-)! Oh cool! Be interesting to hear what you think. I’m still only going to use it sparingly, but it’s nice to have another option in the pantry. I’d heard about the “effect” it has on some folks – didn’t have a problem- much to the relief of others in the household ;-). I was really pleased with the pumpkin bread :-). Thanks, Sophie! It is really hard – I’m not 100% refined-sugar-free, but I’m close :-)! Appreciate your comment, Margot! I very close to being refined-free. Still having the coffee creamer habit, but have been using a lot less. Amazing what a tough habit (sweet!) it is to kick, isn’t it? I really liked this product!! The only down side was the gas…HAHA. Too much xylitol = gasssyyyy tummy!! I don’t have much control over cookies, so I ate a lot of xyla when I baked with it. I loved the gum too..it was so good! I really need some of that cake! Guess I dodged the gas bullet on this! I’ve never heard of Xyla, I wonder if we get it over here. I have noticed Stevia and other sugar substitutes popping up on supermarket shelves recently so I’ll keep an eye out. Your photographs are beautiful. I’m curious how Xyla tastes as I am not a fan of stevia due to it’s aftertaste. Your blog, content and photos are amazing. Keep it up lovely Ann. Yeehaw! I have never tried Xyla, but I am anxious to as I am not a fan of stevia due to its aftertaste. Your photos and content are amazing. Keep up the great work Ann! Yeehaw! Stevia definitely has an aftertaste after a certain quantity is used – not pleasant. This stuff worked really well and truly had no funky taste. I am a big stevia fan but it really does limit my baking. Would love to try this! I hear ya, Deb! This product definitely solves that issue. Have been trying to for a month now. I’ve been sticking to maple syrup and raw honey but some recipes just call for sugar and that’s where I stumble. I know it, Elena. There are just certain desserts that need the texture and chemistry (for lack of a better word) of sugar. Trying to wean myself off of those kinds of sweets ;-). Hard! I’ve always been a sugar addict and I want to change that by eating sweeteners that won’t get me in that sugar coma! Hope you have the opportunity to give xylitol a try – and there are other sweeteners (stevia is really good for certain things) out there that won’t mess with your head!! My hubby would LOVE those banana split cakes and I would love the pumpkin quick bread. They look seriously beautiful!!! I try to not eat refined sugars at all. It really fails in comparison to other raw sugars that I don’t know why people still eat it. But then again HFCS still exists so why am I surprised? My wife is a gum addict, and I’ve been trying to find a more natural version of this. I think I’ve finally found my answer. Thanks! The other thing that gets me is that sugar/sweeteners are in everything! Scary. Almost! fruit is the best option for the craving! I still working on totally eliminated refined sugar from my diet, but have been successful in finding alternative ways to sweeten my drinks. I even have come to enjoy unsweetened beverages more like tea and water with a slice of lemon. Heh…I share the same KAF catalog addiction. My wishlist is a mile long. I’ve never tried xylitol, but did have it in a cake my SIL made once. More options are always a good thing! Do you subscribe to their Baking Sheet? I always look forward to my copy and t’s a lot of fun, though I have to convert most of the recipes to exclude animal products. I have never tasted but it looks yummy! NuNaturals is wonderful. I have a bunch of their products in my pantry. Thanks so much for entering the giveaway! After a few years of a basically sugar-gree diet, I’ve returned to some unhealthily sweetended foods, like frozen yogurt and drinks mixes sweetened with splenda. I definitely need to kick this habit! You can do it, Jordan! There are some great alternatives out there – including xylitol :-)! trying to kick my sugar habit! Thanks! Sweet potatoes would work great!